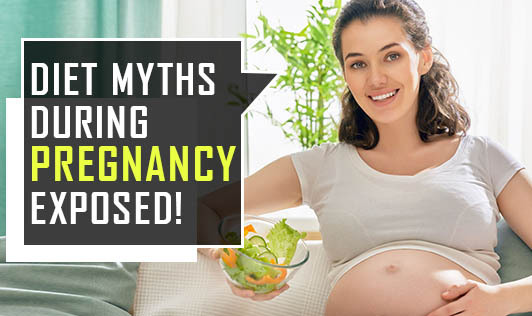 Diet Myths During Pregnancy Exposed! Pregnancy is a time when one gets to listen to a number of diet myths and you too must have heard them all. A lot of the things you hear might not have a scientific explanation. Here are a few known myths listed. Fact: Energy requirements only increase by about 300 calories per day during pregnancy. Doubling your quantity will result in excess weight gain and associated risk factors like gestational diabetes. So, eat 3 proper balanced meals a day with healthy snacks in between. And keep yourself well hydrated. 2. Myth: Pregnant women should give up coffee and tea. Fact: Coffee or tea in small amounts will not affect the baby. As a general rule restrict the intake to 1-2 cups a day. Too much of caffeine might result in a baby with a low birth weight or can increase the risk of miscarriage. 3. Myth: Having saffron in milk increases the complexion of the baby. Fact: There is no scientific evidence to support this belief. The complexion of your baby purely depends on genetics and not the kind of food you consume during pregnancy. If you or your husband, or anyone of your immediate family members are fair, then your baby may inherit a fair complexion. 4. Myth: Vegans meet less protein and iron requirements. Fact: Meat, eggs and poultry are not the only form of protein. Vegans can get their protein from foods such as soy, milk and milk products, legumes, nuts, pulses etc. Consuming good amounts of fruits and vegetables and increasing the vitamin C intake helps to meet iron requirements. Also do not forget to take iron and folic acid supplements, if prescribed by the gynecologist. 5. Myth: Papaya is a "no - no" during pregnancy. Fact: There are controversial studies going on in this area. A fully ripe papaya is not considered dangerous, due to the source of anti oxidants, vitamin and minerals. A papaya that is unripe contains a latex substance and papain which triggers uterine contractions and thereby could lead to miscarriage. Have a healthy pregnancy with proper diet planning. Take some time to review your diet and discuss all your concerns with your health experts or Dietitian!